Welcome to US Web Converting Machinery Corporation. 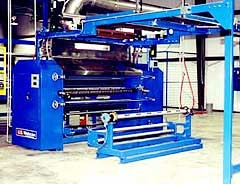 Manufacturers of custom and standard web converting and web handling equipment. Please follow the links below to see an example of a unwind stand, rewind stand, turret winder, turret unwind, flame laminator and many more. If you don’t see your exact machine give us a call and our engineers will be glad to go over your custom requirements.